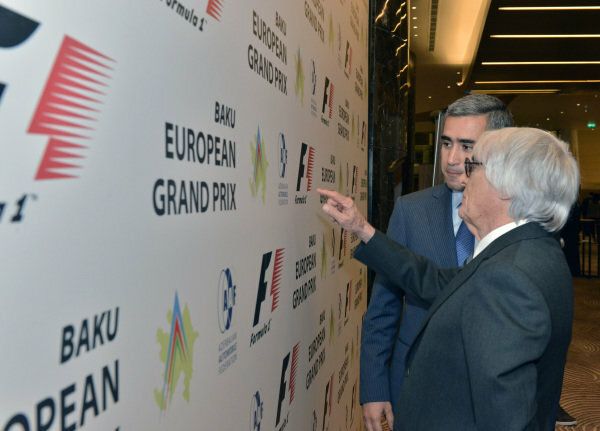 Bernie Ecclestone (GBR) CEO Formula One Group (FOM) and Anar Alakbarov (AZ) Executive Director of the Heydar Aliyev Foundation and President of Azerbaijan Automobile Foundation.<br /> Baku European Grand Prix Street Circuit Press Event, Baku, Azerbaijan, 7 October 2014. 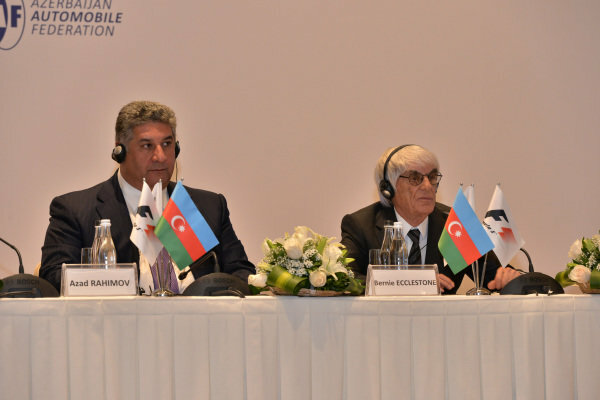 (L to R): Azad Rahimov (AZ) Azerbaijan Minister of youth and sport, Bernie Ecclestone (GBR) CEO Formula One Group (FOM).<br /> Baku European Grand Prix Street Circuit Press Event, Baku, Azerbaijan, 7 October 2014. Map of the Street Circuit of Baku. 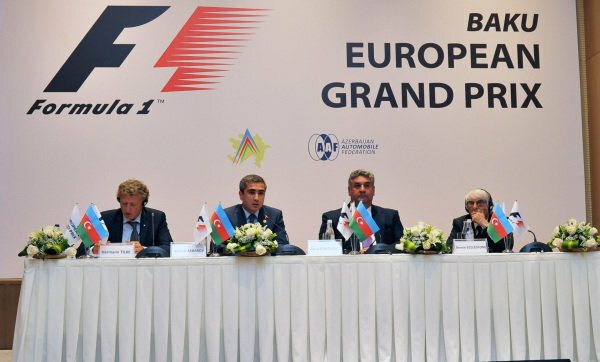 <br /> Baku European Grand Prix Street Circuit Press Event, Baku, Azerbaijan, 7 October 2014. 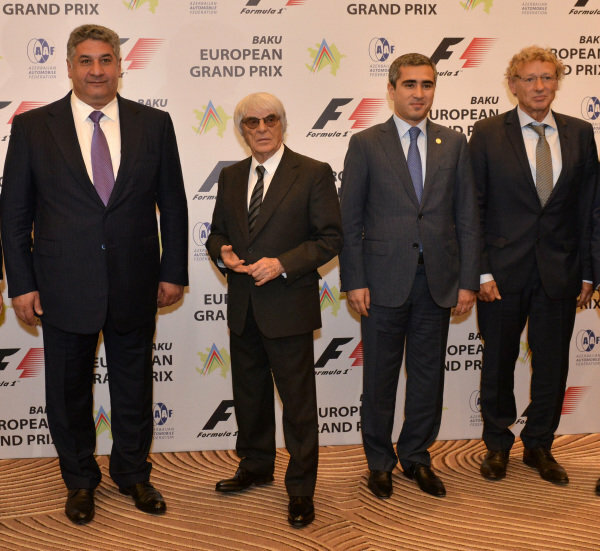 (L to R): Hermann Tilke (GER) Circuit Designer, Anar Alakbarov (AZ) Executive Director of the Heydar Aliyev Foundation and President of Azerbaijan Automobile Foundation, Azad Rahimov (AZ) Azerbaijan Minister of youth and sport and Bernie Ecclestone (GBR) CEO Formula One Group (FOM) .<br /> Baku European Grand Prix Street Circuit Press Event, Baku, Azerbaijan, 7 October 2014. (L to R): Azad Rahimov (AZ) Azerbaijan Minister of youth and sport, Bernie Ecclestone (GBR) CEO Formula One Group (FOM), Anar Alakbarov (AZ) Executive Director of the Heydar Aliyev Foundation and President of Azerbaijan Automobile Foundation and Hermann Tilke (GER) Circuit Designer.<br /> Baku European Grand Prix Street Circuit Press Event, Baku, Azerbaijan, 7 October 2014.